My first card uses the new Filled to the Brim stampz. I painted the cup and saucer image with Sugar Plum and Buddy's Favorite Color Shimmerz, Palm Reader and Elfin' Magic Vibez, and See Ya Latte' Spritz. I fussy cut the cup and acccented with a white gel pen and a little crystal clear gloss. Next I set to work on a background for the card. I stenciled Sugar Plum onto watercolor paper with the All Over Snowflakes Hot of the Press stencil. Once this was dry, I sponged some Tumbled Glass Distress Oxide ink over the background to give a winter glow. 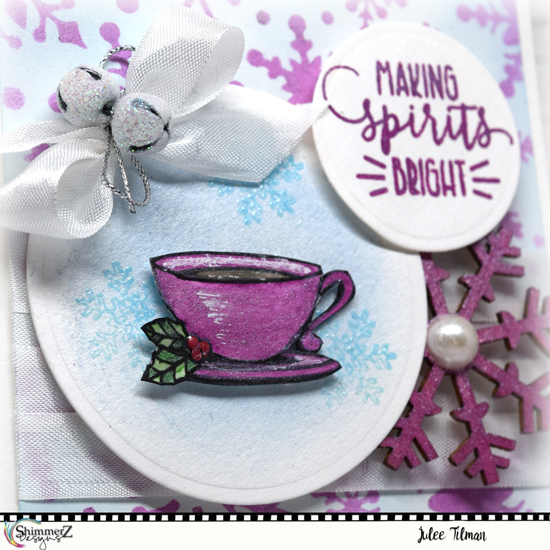 For the circle behind the cup, I sponged a bit of Colder than Ice Shimmerz, then embossed the snowflake from the Filled to the Brim set with tumbled glass distress oxide ink and clear embossing powder. The sentiment is stamped in seedless preserves distress oxide on another circle die cut. I embellished with a wooden snowflake I painted in Sugar Plum and then accented with a flatback pearl. A seam binding bow sports a little duo of glittered jingle bells to finish things off. My next card features the adorable new Snow Amazing stamp set. I first stamped the snowman image on watercolor paper and got to work painting him with Sugar Plum and Royal Purple shimmerz. I mixed a bit of the sugar plum to cold as ice shimmerz and then watered it down to do the shading on the snowman. I've never done purple shading on a snowman before, but it works! 😃 Next I fussy cut around him, leaving off the more difficult to cut branches and birdies to stamp on a different layer. I then inked up the image just from the ornaments upward and stamped onto a piece of watercolor paper. I colored them with Shimmerz paints, then made a quick mask and taped off a section for a starry background. I then did a wash with Colder than Ice and when it had dried, I used a falling stars layering stencil to add Winter's Mist stars to the background. I then peeled up the tape and added my fussy cut snowman over the top with collage medium. The branches are done in So Sappy Shimmerz and the carrot nose in Pumpkin Shimmerz. The sentiment is stamped onto a vellum circle and I accented with a couple of chipboard snowflakes from the Scrapaholics Let it Snow set. I painted them with a coat of Colder than Ice and then accented each with a rhinestone. A seam binding bow across the bottom finishes things off. Thanks so much for stopping by today! 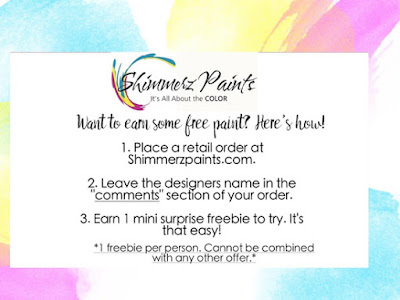 If you place an order in the Shimmerz store, remember to put my name, Julee Tilman, in the comments to recieve a free little gift!